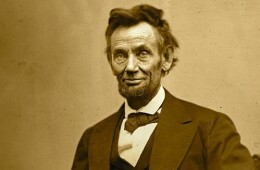 Seven score and ten years ago, Abraham Lincoln went to the site of a battlefield in Gettysburg, Pennsylvania. After a two hour oratory Edward Everett, Lincoln took the stage and gave a two minute speech that has gone down as one of the greatest in American History. Brief and to the point, Lincoln hearkened back to what this country was founded on. I believe that 150 years later it is a lesson that we must rehear. Nearly everyone knows how the Gettysburg Address starts but it is what follows that should be remembered. There are lessons here that still ring true today. Our nation was brought forth with the ideals of liberty. It wasn’t perfect, but as any child it grew and liberty expanded with it for the first 125 years. Yet in the past 100 or so our liberty has begun to ebb. Gun laws, income taxes, restrictions on practicing religion, on speech, and on the press, the rise of warrant-less searches etc. For a while now we have been engaged in a civil war testing whether our nation that was founding in liberty can long endure. We do not fight with guns and the enemy is not always clear but the fight is true enough. Will we remain a nation free or rather become one that is run not by and for the people but rather the government. The battles are at the ballot boxes, in public opinions, in the halls of congress and in the courts. And while the battles do not carry the same toll that has felled many a brave man and women in the wars of the past, if we lose the battle for our country’s soul then their sacrifices will be in vain. We will have squandered the freedom that they bought with their last full measure. We must be dedicated to the great task remaining before us, that this nation, under God, shall have a new birth of freedom, and that government of the people, by the people, for the people shall not perish from the Earth.